While the products have been in development for almost 18 months, the long-awaited doll sets of Bunsen & Beaker and the Kermit & Miss Piggy Wedding Set highlight this year's new collectibles from Igel and Junior Toys. A science experiment gone terribly wrong? 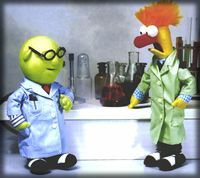 No, it's just Bunsen and Beaker as plush dolls. For the first time ever you can snuggle up with your favorite scientist and his assistant Beaker. Dr. Bunsen Honeydew comes complete with his trademark glasses sans eyeballs. Beaker has that classic surprised look which will be helpful for when you come up with your own experiments in the lab. Of course, what scientist would be complete without a lab coat and saddle shoes? When asked how he felt about being portrayed in doll form, Beaker replied, "Meep, meep, meep, meeeeep!" Well that pretty much sums it up. While a small beanie of Beaker was released last September by Disney, Bunsen has never been available in doll form making this a set collectors have been waiting for. 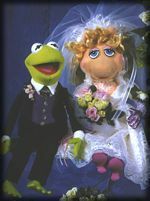 The Wedding Set features none other than Miss Piggy and Kermit all dressed up for their moment of knot tying. Miss Piggy is wearing a white lace wedding gown while carrying a bouquet of yellow and pink pastel roses that accentuate her purple gloves. A pearl necklace, pink pumps and a ribbon tiara finish off Miss Piggy's stunning look. Kermit, the dashing groom, sports a black tuxedo with a single breasted jacket and pin-striped pants. A purple vest and tie compliment the entire ensemble. With permanent grins, this happy couple will certainly become a favorite among many Muppet fans. Large 5 foot plushes of Statler & Waldorf, Gonzo, Animal, Miss Piggy, and Kermit will also be available in limited quantities. A 5 foot plush Swedish Chef was released last year. Some other new Igel items include classic black backpacks featuring an embroidered picture of Kermit or Animal, new Muppet dishes, paper supplies, character keyrings, and kitchen magnets. Another Igel highlight is a very extensive line of fun Swedish Chef items for your kitchen including cups and plates, kitchen towels, crockery, aprons, egg cozies, pot holders, canisters, salt and pepper shakers, and much more. Also available are wooden kitchen utensils that are perfect for tossing up in the air. Sadly, salad and rubber chicken are not included. The company a la carte is releasing a beautiful large plastic latex figurine of Bunsen and Beaker to go with last year's releases (Statler & Waldorf in theater box and the Swedish Chef with a Muppet chicken). These finely detailed figures stand approximately 24 inches tall and are 100% Muppety fun. Additional figurines of Kermit and Animal will be added to this line in the coming months.